I have nieces and nephews who have big fears. The majority of my nieces and nephews are more fearful than the kids around them. 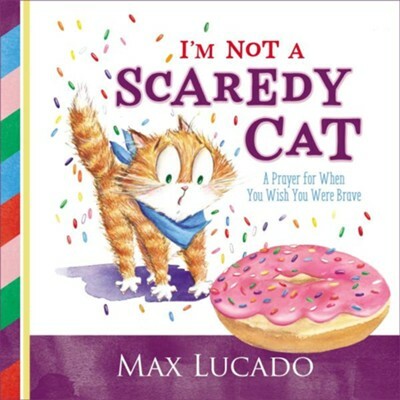 I was excited to read and review I'm Not a Scaredy-Cat with the hope of sharing it with them. I enjoy Max Lucado's adult books, but this book was not really written in a way that makes it seem like something from him. It is a good book, but a lot more simple than his other books - both his children's ones and adult ones. The pictures in this book are fun and colorful. This book is good for any kids who struggle with fear. I think it is appropriate for about age two through eight. This book is fun to read and yet it has a message, too. The pictures are fun to look at. I like that this book tackles fear. There is nothing in particular that I didn't like in this book. Overall, I think that this book will make a fun gift for my nieces and nephews. I give I'm Not a Scaredy-Cat 5 out of 5 stars.